One of the things I really enjoyed about the Mass Effect series is how it handled its universe’s enormous backstory. BioWare did an amazing job of incorporating an appropriate amount of lore into gameplay while leaving the rest of it - all of it, really - in an easily accessible codex. It is meticulously sorted and filled to the brim with information about the races, places, and histories of the Mass Effect universe. You want to know more about the Krogan and the effects of the Genophage? There’s an entry for that. You want to know more about the Citadel? There’s an entry for that. Want to know about extinct species of great importance, like the Rachni and Protheans? There are entries for those, too. All you have to do is hit pause and navigate over to the Codex to learn more, as long as you have access to that information at the point in the game. It’s neat and tidy, and makes it simple for us to better appreciate the world of Mass Effect. Let’s contrast that with Destiny, where the overarching story is somewhat obfuscated by dense, intentionally obtuse dialogue and narration. This is done to give the series a mythic quality, as if we players are not only playing a sci-fi opera, but also a modern fairy tale. The only problem with this approach, however, is the lack of knowledge regarding the importance of things, people, and places. All of those details are left to Grimoire cards, a collection of write ups that elaborate on some of Destiny’s lore. It would be fine to have this system in place, but Bungie designed it so that the only way you can see them is on a specific website, far removed from the game. It intentionally takes you out of the game in order to tell you more about itself, which makes no sense to me. Ruining the illusion of immersion is a cardinal sin in game making, and for whatever reason, Bungie went ahead with this course of action anyway. Some of the best stories, like tale behind the Last Resort handgun or the backstory of Oryx hidden in the calcified fragments are shrouded from view and require too much effort on the part of players to access them. 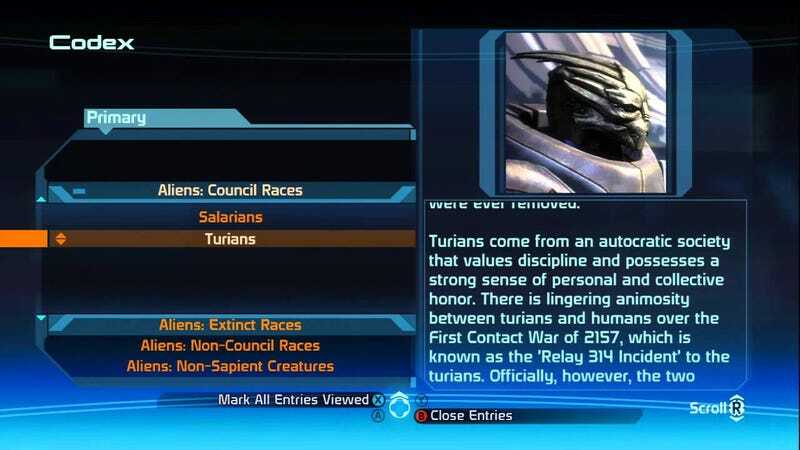 Mass Effect sidestepped this issue by having it ready for the player to peruse whenever they wanted in the game. As a result, I actually have a consummate knowledge of most things found in the series. Destiny, on the other hand, leaves us out in the woods to forage for ourselves. When given a choice, I’ll always with the generous over the stingy.